to be used by all Financial Standards Initiatives ! 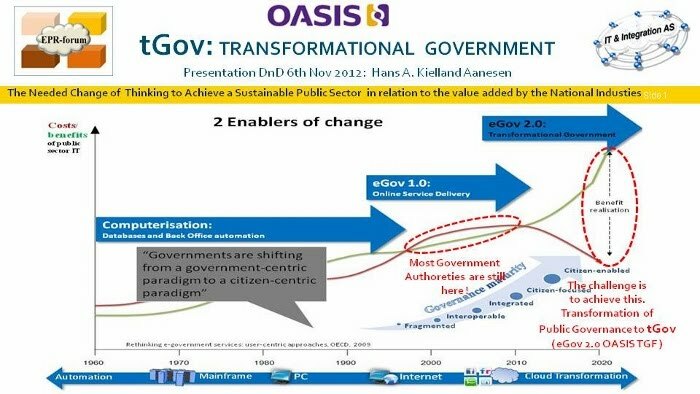 "Public Cloud & Sustainable Digital Ecosystems paradigm"
1: SELF-MANAGEMENT & SELF-SERVICE ! The tGov-initiative was initiated by EPR-forum because of the general lack of needed political understanding in using universal and global "open" META-standards on today's Internet information exchange to succeed with the ongoing Interaction reform here in Norway. Our common society need to avoid wasting more money on the silo and isolated single discipline standard software solutions that have been going on over the last decades. We need a switch in thinking by starting with the needed public META-information exchange standards and general open XML functional modeling as a requirement given by the Public sector to achieve progress in the societies need of open and general information exchange between all kind of software platforms and vendor solutions. It means a Multi Discipline & Interacting Requirement Regime that is common for all software vendors ! Then we will achieve fair competition between software vendors and avoid the major software vendors to set the "traffic" rules that lock and prevent the interaction reform to succeed. 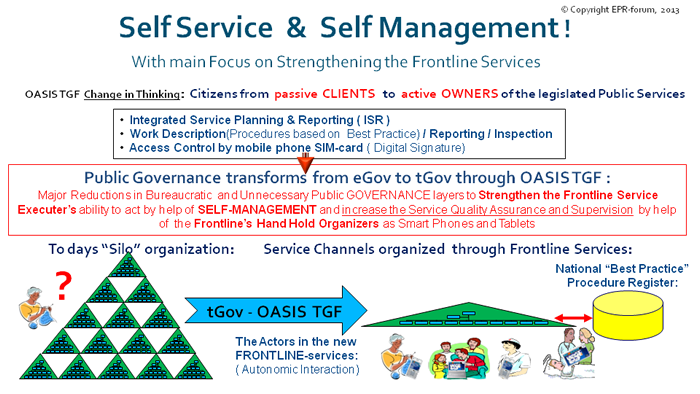 With the OASIS TGF (Transformational Government Framework) in mind this home page is related to the Service Oriented Approach of the EPR service management Tools and Cloud Agents ( TEMPLATE ENGINES ). Here you will be advised in how to use the new way of software Engineering regarding Template editing and processing. It will give you insight in this new Superstructure ( META ) Templating implementation work. You will be able to construct and utilize reusable SCENARIO TEMPLATES in the new and fast development tools available interacting with "loosely coupled" applications in both old and new legacy- and expert-systems in Real-Time. 2: CLOUD(Internet) of THINGS ! Access and use of Lookup tables and Dictionaries for the different "Application Areas" you will find in the sidebar. EPR-forum predict exstensive use of SmartPhones and Tabletts in the execution of Public Home Care services. This enabled by help of the new HTML5 browser standard and Cloud Transformation with Service Management Templating. Social entrepreneurship is to introduce new solutions to social problems and make these service solutions available to as many people as possible. This is only enabled through open neutral not-for-profit organizations that is seeking methods and mechanisms for common international interoperating rules and open integration regimes. Social entrepreneurship has primarily to do with actions and usually less to do with politics. Never the less "social entrepreneurship" in a well developed country as Norway with a high focus on public legislated welfare and health care need to be "political" since contact with public authorities is inevitably. Because of involving both public and commercial interests it's incredibly important to differ between the public administrative role and industry's commercial role without mixing these roles like it is today. Some looks upon organizations like OASIS and EPR-forum as a democratic problem since their social entrepreneurship tries to solve the problems the welfare state is struggling with. We consider the social challenges from the sidelines and feel that the public sector so far is not able to find the right solutions. Many feel our lives are too short in waiting for the new fair solutions to happen. Those who experience the challenges and problems of today's health care services in Norway have even less time to get proper help. In the lack of needed upcoming public solutions it pushes creativity and initiatives from citizens who have worked with collaboration issues, ICT integration and harvesting "Best Practice" processes and procedures in the commercial life into Social Entrepreneurship. We in the EPR-forum and by OASIS represent such an initiative for new solutions when the public so far have failed in progress. The politicians and bureaucrats want solutions, but it appears obvious that they unfortunately do not know how and leave their public administrative role to commercial market forces alone resulting in today’s anarchy and the catastrophic dead end progress. The Norwegian Ministry of Trade & Industry has just announced an evaluation study concerning the potential use of social entrepreneurship in Norway. The recognition and positive attitude that lies in these statements and initiatives are encouraging. But it is not primarily the design, but the execution of the policy that currently slows the progress of new social solutions. The Norwegian Interaction reform is just empty words if you do not know how it should be implemented in real life. It should also be noted that the Social Entrepreneurship do not substitute public, nonprofit or private organizations solutions. It is a no man's land, or perhaps better an "all-man's land" where the public, nonprofit and private spheres overlap. In this area where all the three sectors know that they fall short, the social entrepreneurs find new solutions by combining new and existing methods. The responsibility of the public sector, the motivation of nonprofit organizations, and the efficiency of the private industry must be exploited by adding a new idea or method at the top that can make enormous difference to people that so far not has been seen or achieved. The current government support to entrepreneurs is primarily given to those who are business oriented with traditional goals and markets. Innovation Norway should make another attempt to find an arrangement that includes those who also have SOCIAL GOALS. While we wait for it, several organizations can provide what they already do nicely in cooperation with social entrepreneurship. Just some small financial support and initial funding along with some business advices are needed to initiate these crucial Social Entrepreneurship initiatives. Another challenge is the bidding rules in the public sector. These rules are designed to promote quality and affordable services, but to avoid taking risks on new innovated solutions, the public sector usually select well-established providers. With the current lack of public supervision and quality assurance measurement regarding these deliveries run the risk that the quality and price do not say anything about the achieved and needed social results. New innovative related offers that seem to be brilliant according to social results tend to loose in competition with the more traditional established vendors because of price and quality even if the needed social results is not that satisfactory. To avoid annoying public noise and attention on these areas in the media when projects and new systems do not work properly or if the results is not as expected EPR-forum will work as a "buffer". EPR-forum with its Social Entrepreneurship has invested and developed mechanism ideas obviously making major changes for many individuals needing health care services. Our contention is that the community commits a much greater risk by not trying these new social community-based open platform solutions, which may result in new functional commercial solutions. The actual development of electronic processes – EPR, started more then 10 years ago. The challenge was to find the answer to the question: Can all routines and business processes be supported by a limited number of standard components? Substantial studies based on many years of experience showed that the answer to the question is YES. Efficiency and quality in work flow and administration. Reuse of information and service management based on Open Best Practice process' and routines. Effective cooperation between government, authorities, citizens and business. In order to reach this target, the basic information used has to be organized in a common and clear way. Quality and efficiency in service providing. Quality demands will be incorporated in the processes and task descriptions. The documentation process of performed tasks has to be handled efficient, and in a way to limit waste of time from the service providing. When the report is processed all statistics and documentation shall be generated automatically. Data support shall be developed in a common user-friendly way. The user interface has to be simple and shall be regarded as natural to use. Minimize costs for application software and production. 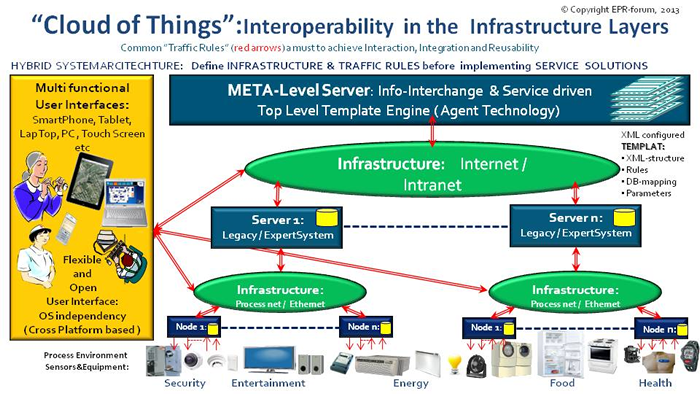 Common platforms build on international standards where heterogeneous technology can cooperate. Integration of legacy systems that will give them an extended lifetime. The possibility to perform electronic inspections and still secure that all physical and administrative actions are traceable.